Best paper trimmer for a small studio? I’m looking into starting my own print/design studio, and was wondering what other people used for cutting down paper and doing finish cuts (on stacks of invitations, for example). I would like something small and electric, but haven’t had any luck finding anything less than 2k. Is there a manual cutter that anyone has experience with? Find a tabletop guillotine cutter. They are fairly easy to move and will not take up too much space. Downside - you have to cut parent sheets down by hand until they are small enough to fit the cutter. I have a manual Challenge “Pony” cutter that has served me really well over the past year. As Steve said, I had to cut parent sheets down by hand or just order paper small enough on one side to fit in the 19.5” mouth (usually pretty easy to do), but for finishing cuts especially it’s great. I’m graduating to a full-sized cutter pretty soon and will be selling it. If you’re in California or Oregon we should talk. 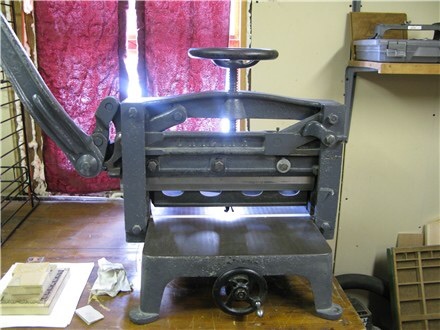 I have it sitting on a table with casters; the table is about 24” x 50” and the cutter weighs ~450 pounds. Unfortunately, I am in North Carolina so…. Not even remotely close. Thanks for the offer though! I know of a few manuals and electric ones available in NY. All under $1000. Give me a call with contact info and I can send details and pics. I was thinking about getting something like this myself. I used a Pavyer utility cutter until recently when I upgraded to a Challenge floor model power cutter. I believe that Ladybones’ Challenge Pony is similar to my Pavyer. Look for one of this style if you can - one with an extra blade and cutting sticks is a plus. It has a manual clamp and hydraulic knife. Runs on 220 volt. Extra blade and all tools.